I started running in order to stay fit for climbing and skiing. It’s a great way to get the lungs working and maintain or improve my endurance when I only have a short time for a workout. It didn’t take long before I was hooked and now I find myself running in order to stay fit for… well, longer runs. Throughout the winter and into the spring some of my favorite trails can be a hazard due to packed snow and ice. Too many times I’ve found myself gripped on a north facing aspect or a steep, treed decent. When I discovered the La Sportiva Hobnail Kit I had to give it a try. While I screwed the first hobnail into my sole, I wasn’t convinced. Then I started running. The added quarter-inch stud was great on the start of the muddy trail. As I made the bend to the first stretch of snow, I started to believe. Then came the dreaded down hill. This time it was a full horror show. Smooth ice, like a Zamboni had just finished multiple passes. I was prepared for a desperate shuffle and feared the wrath of gravity. The Hobnails made easy work of the difficult conditions and inspired me to take a longer loop with another steep gully. There and then I declared that Hobnails were the Shiz-nit. For my set up, typically I don’t plug too many of the studs into my shoes. I go with three up front and two in the back. This seems to give me enough traction without over doing it. 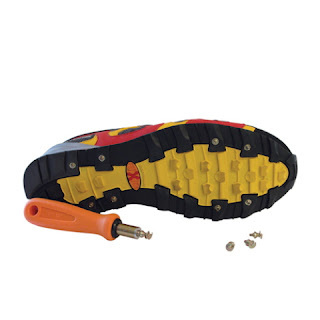 The tool that comes with the kit makes it easy to “plug in and pull out” the studs and I’ve been pleasantly surprised with how little it affects the sole of the shoe. If you’re looking to extend your trail running season and explore some areas that tend to get snowy and iced-over, check out the Hobnails from La Sportiva. Avoid looking like Bambi on ice and gain a lot of traction without a large investment. hey!! I have the same shoes, I love go to walk around the mountains and these shoes are so appropriate!! I like a lot the winter sports such us Skiing , I think that this post gave us many good ideas to take vacations! Thanks for the post. It can be really hard putting your life together. I know that drug addiction intervention can make a big difference but, can be difficult to do on your own. Get help today.